Rebecca Remillard, DVM, PhD, DACVN, is founder and president of Veterinary Nutritional Consultations, where she specializes in formulating strategically appropriate dietary recommendations for dogs, cats, and horses with medical conditions. She has been published in several veterinary journals and textbooks and has extensive veterinary teaching experience. Dr. Remillard earned her DVM from Tufts University. Michelle Evason, DVM, BSc, DACVIM (SAIM), is an associate professor of small animal internal medicine at Atlantic Veterinary College and is working toward her PhD in infectious disease at University of Guelph. She also works as an independent medical and nutrition consultant. Her clinical and research interests focus on infectious disease, nutrition, and client and veterinary perceptions regarding health and disease. To access full articles on www.cliniciansbrief.com, please sign in below. Want free access to the #1 publication for diagnostic and treatment information? Create a free account to read full articles and access web-exclusive content on www.cliniciansbrief.com. *You must fill out all information to continue. Subscribe now to our journal! I wish to receive (continue to receive) a FREE subscription to Clinician's Brief. Clinician's Brief, the leading journal for small animal veterinarians, provides essential tips for diagnosis and treatment in a brief and concise format. Subscribe now to our electronic newsletters! Clinician's Brief Newsletter delivers cutting-edge resources, expert practices, & clinical tips to the small-animal practitioner every weekday. Ready to fast-track your way to optimized patient care? Sign-up now. The global Clinician's Brief newsletter – offers valuable insight for international readers with featured articles, quiz questions, videos, and other practical expertise. Global Brief is published in collaboration with WSAVA. We found some problems with the form. Publisher reserves the right to determine qualification for free subscriptions. Protein is an essential dietary component for cats and dogs. However, questions from pet owners about protein content in pet food can cause difficulties for clinicians. This is largely due to conflicting recommendations about how much protein is needed for certain life stages and specific medical conditions. Further, pet owner and veterinary attention is frequently drawn to the protein value provided on the food product label, despite lack of a clear understanding about how that number is derived or should be communicated. To have an informative discourse with pet owners and improve dietary recommendations, clinicians should understand the following 5 important points regarding dietary protein. The crude protein number on a pet food product label is a calculated estimate. Although the term protein is easiest to refer to on the product label, this term actually refers to a calculated estimate. As such, product labels typically list crude protein. The protein number (% as fed) is based on a laboratory determination of the total nitrogen content of the food, which is then divided by the average nitrogen content of proteins (ie, 16%).1 Not all nitrogen content in a food/product is in the form of protein; dietary ingredients (eg, carbohydrates, fat, fiber, supplements) contain nonprotein nitrogen that contributes to the total estimate for crude protein. Pet food labels typically list only the guaranteed minimum crude protein, so this value should not be taken as the actual protein content in the product. Understanding how the crude protein value is determined and expressed on the product label should help reduce the emphasis placed on this number by pet owners when comparing products or as a determinant of diet quality. Animals require essential amino acids, not protein, from their diet. Specific essential amino acids (not dietary protein) are required by each species to support growth, maintenance, gestation, and lactation and to avoid disease. After consumption and digestion of dietary proteins, animals use the essential amino acids and synthesize nonessential amino acids for serum proteins, muscles, and other necessary nitrogenous compounds the body requires. 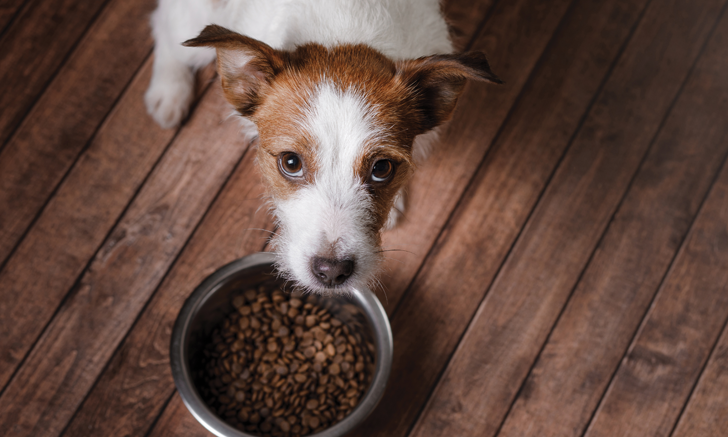 The crude protein number on the pet food label does not provide any information regarding concentration, ratio, or digestibility of the essential amino acids in the product. It is important for clinicians to understand and explain to pet owners that there is no perfect protein ingredient for dogs or cats. In fact, a variety of protein ingredients are needed to meet the essential amino acid requirements. Therefore, pet food products may have individual synthetic amino acids (eg, methionine, taurine) added to meet unique feline or canine requirements when the protein ingredient(s) is low or devoid of essential amino acids. A dry pet food with a product label minimum crude protein of 35% exceeds that recommended for both canine and feline growth; however, if the product does not contain the essential amino acid taurine or a sufficient concentration of arginine, a puppy will do poorly and a kitten will not survive. The crude protein number reveals nothing about taurine or arginine content. High-protein foods do not necessarily meet essential amino acid requirements any better than do low-protein foods. Protein adequacy can only be assured through standardized feeding trials or nutritional review. The nutritional adequacy of a product (and its protein) can be evaluated through standardized animal feeding trials, which measure protein bioavailability. The Association of American Feed Control Officials (AAFCO) is often cited for its published feeding protocols.4 A food fed for 6 months as the sole diet to adult dogs (and with certain biologic criteria met) is allowed the claim of nutritionally complete and balanced as substantiated by feeding studies.4 Identifying this statement on a product label should provide pet owners additional assurances regarding overall product quality, as it verifies through standardized testing that the amino acid content was bioavailable and adequate for a healthy pet outcome. None of these assurances can be made through the crude protein number. Veterinary nutritionists often disregard the crude protein value listed on the pet food product and instead focus on amino acid content, which they will calculate as a percentage of the essential amino acid recommendations suggested by the National Research Council (NRC) or AAFCO for the various life stages (growth, gestation/lactation, maintenance).5 Listing specific amino acid information is not possible on pet food labels due to space constraints. However, pet food manufacturers can choose to list amino acid content online or in company product guides. Pet food protein recommendations are suggested ranges. Dietary protein concentrations recommended by NRC and AAFCO include a margin of safety to account for known negative ingredient interactions, losses, and bioavailability uncertainties across the variety of ingredients used by manufacturers. NRC has 2 types of nutrient recommendations: minimum requirements (MR; ie, the amount needed if the nutrient is readily bioavailable to the animal) and recommended allowances (RA; ie, the greater amount needed when bioavailability is reduced by known food interactions). The RA value is equal to or higher than the MR value; for example, although the NRC protein MR for healthy adult cats is 40 g/Mcal, the RA is 50 g/Mcal because dietary protein sources are not 100% bioavailable from the food. AAFCO, which operates independently of the NRC, generally has a wider safety margin on pet food protein content for adult dogs and cats. Neither NRC nor AAFCO values should be mistaken as the minimum requirement for an animal, nor should they be interpreted as optimal. Multiple factors can impact desired protein content (eg, food digestibility and amino acid content, individual variation, disease processes), and an understanding of terminology and requirements is needed before veterinarians make a protein determination for a specific patient. There is a wide range in protein values (15%-60% dry matter basis) listed and recommended by various pet food companies, even for similar products intended for the same life stage and sold by the same company.5 These values are typically higher than those recommended by NRC and AAFCO, even though increased protein is neither better nor is there a demonstrated nutritional need for it. A patient with high BUN but normal creatinine (and SDMA) and normal kidney function on urinalysis is eating an unnecessarily high protein (>30% dry matter basis) diet relative to its need. The pet's BUN indicates that the excess dietary protein is being metabolized to urea by the liver and then excreted from the body via kidneys, demonstrating that feeding excess (ie, unneeded) dietary protein is readily eliminated from the body within hours of consumption. Because protein ingredients are a major determinant of pet food price, the unnecessarily high-protein products will cost more to feed. Protein recommendations for dogs and cats with various medical concerns differ. The decision to adjust dietary protein concentration should be based on current protein intake. In many cases (eg, weight loss, osteoarthritis, feline diabetes, feline hyperthyroidism, senior pets with decreased protein metabolism), a protein level above AAFCO recommendations may be desirable.6,7 In contrast, there are medical conditions for which protein levels closer to NRC RA or MR would be helpful (eg, late-stage liver or renal disease).8 Clinicians should understand that for any medical condition, increasing or decreasing protein intake should be relative to the patients current protein intakenot relative to NRC or AAFCO values. This underscores the significance of a dietary history. Of importance, neither NRC nor AAFCO recommend specific nutrient levels for medical or health-related conditions. Recommended amounts of specific nutrients of concern (eg, fat, potassium) for medical conditions are typically set by nutritionists and allied specialists and are based on known specific disease processes. Thus, the recommended dietary concentrations for particular medical conditions will vary among pet food manufacturers and individual specialists. For example, low-protein therapeutic diets (eg, those marketed for kidney conditions, liver conditions, or uroliths) designed for long-term feeding typically are at or above the NRC crude protein RA9 and use highly digestible (>80%) ingredients with good amino acid profiles (eg, egg, liver, whey). This is done intentionally to ensure that essential amino acid needs are met while offering a lower total nitrogen (ie, crude protein) load to reduce impact on various body organs. Diets with 10% dry matter protein that are properly formulated to first meet the essential amino acid needs have been safely fed to dogs for decades with poor kidney or liver function (eg, IRIS Stage 4, Dalmatians with urate urolithiasis, dogs with hepatic encephalopathy). Suggest a range of crude protein values rather than a specific number based on the pet's life stage according to NRC (RA) or AAFCO recommendations. It may be helpful to emphasize to pet owners that high protein intake has not been shown to be medically superior in healthy pets. High dietary protein intake does not increase muscle mass in the absence of exercise. Explain the difference between food products that meet current recommendations through feeding trials and nutritional review versus through those said to meet nutrient levels through analytical methods. Examine the patient, noting the current diets crude protein value, and assess muscle mass and serum total protein, albumin, WBC and RBC counts, and hemoglobin. This information (if within normal limits) will suggest adequate protein intake. In addition, asking pet owners about their concerns regarding protein concentrations can lead to further discussion about nutrition and will emphasize the shared goal of maximizing pet health. Drs. Remillard and Evason are also advisors with Rayne Clinical Nutrition. Association of Official Agricultural Chemists. Protein (crude) in animal feed. In: Helrich K, ed. Official Methods of Analysis of AOAC International. 15th ed. Arlington, VA: AOAC; 1990:74. Swaminathan N. Why is melamine in baby formula, your foodand your pets meals? Scientific American. https://blogs.scientificamerican.com/news-blog/why-is-melamine-in-baby-formula-you-2008-09-24. Published September 24, 2008. Accessed January 12, 2018. Association of American Feed Control Officials. 2016 Official Publication. Champaign, IL: AAFCO; 2016:150-190. Debraekeleer J, Gross KL, Zicker S. Feeding young adult dogs: before middle age. In: Hand MS, Thatcher CD, Remillard RL, Roudebush P, Novotny BJ, eds. Small Animal Clinical Nutrition. 5th ed. Topeka, KS: Mark Morris Institute; 2010:263. Larsen JA, Farcas A. Nutrition of aging dogs. Vet Clin North Am Small Anim Pract. 2014;44(4):741-759. Laflamme D, Gunn-Moore D. Nutrition of aging cats. Vet Clin North Am Small Anim Pract. 2014;44(4):761-774. Elliot J, Barber PJ. Feline chronic renal failure: clinical findings in 80 cases diagnosed between 1992 and 1995. J Small Anim Pract. 1998;39(2):78-85. Evason M, Remillard RL. Chronic kidney disease staging and nutrition considerations. Clinicians Brief. 2017;15(3):89-95. For global readers, a calculator to convert laboratory values, dosages, and other measurements to SI units can be found here. Material from Clinician's Brief may not be reproduced, distributed, or used in whole or in part without prior permission of Educational Concepts, LLC. For questions or inquiries please contact us. With RACE-approved courses for the brief, relevant Clinician’s Brief articles you love, we’re your home for online CE. Earn up to 32.5 hours of RACE-approved CE with Clinician’s Brief content.